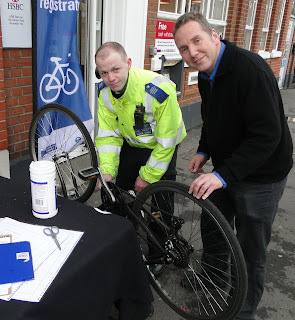 The Police* are offering free bicycle marking and registration at Maple Lodge (the big white building with the clock on top) in the Hamptons (KT4 8AS) on Saturday the 6th of April from 12-3pm. The owner’s details are kept on a database together with a unique code which is etched into the bicycle frame. So many stolen bikes are recovered but the police have no way of reuniting them with their owners so they end up going for auction. When a registered bike is recovered they simply have to look it up to find the owner and arrange to get it back to them. Security marking your bike also deters potential thieves as your bike can be easily traced if it is stolen. 47 bicycles were registered back in January - the last time the police held this event in Worcester Park. Local campaigner Simon Densley took his bike along to this and told the Worcester Park Blog afterwards, "I have had two bikes stolen from me just in the last couple of years and it gets expensive having to replace them. The police work very hard trying to catch and stop these criminals and if we can make it easier for them to return our property when they recover it we should. Hopefully this one won’t be stolen but if it is I now have a much better chance of getting it back!" There will also be a representative from CYCLE POWER in Central Road on hand offering free cycle safety checks. For more information and cycle marking dates visit www.met.police.uk/transport. * The Cycle Task Force, part of the Transport for London (TfL) funded Metropolitan Police Service Safer Transport Command and Worcester Park Safer Neighbourhood Team.